Gopal Rai (seated) presides over a national meet of the Shramik Vikas Sangathan or SVS at which the author is speaking. 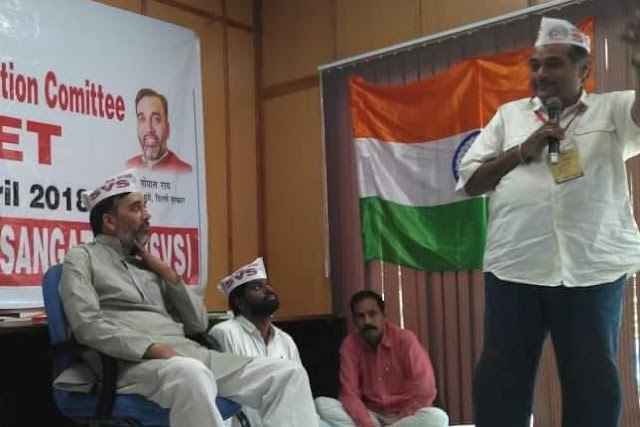 Gopal Rai founded the SVS in 2015. SVS is the labor union of the AAP & advocates for higher minimum wages in many states. The Delhi Government of Arvind Kejriwal has been making progress in ratcheting down the cost of utilities and improving healthcare access through its “Mohalla (Community) Clinics.” One area where the Delhi government has made significant strides (but received insufficient credit) is in raising minimum wages for the state. - Skilled worker wages from Rs. 11, 830 to 16, 858. That represents a whopping over 42 percent jump for all three worker groups. Delhi now has among the highest minimum wages in the country. Only Kerala with its NRI income, relatively developed infrastructure and manpower shortages has higher wages. Kerala earns an estimated 40 percent of wages repatriated by NRI's abroad. On December 4th, 2018 *2, the Delhi government announced a minimum wage drive with amended wages of Rs 14,000, Rs 15, 400 & Rs 16, 858/month. (The Minimum Wage Amendment Act as implemented in Delhi provides for a Rs 50,000 fine and/or three years of imprisonment for those who contravene it. A complaint number (Tel. #155214) has been provided so that workers with complaints can call in. Employers who fraudulently gamed the system are being caught and prosecuted. High wage areas like New Delhi and Kerala tend to induce worker migrations. Kerala is dangerously dependent on migrant workers. An estimated 13-14 percent of its population is migrant labour. In Kerala, at least officially, the lowest minimum wage is Rs 600/day. Multiplied by 26 days per month that works out to Rs 15, 600, monthly. According to the web-site “Simpliance” unskilled labourers make Rs. 8, 541.61 and Rs. 7, 675 per month in Haryana and Uttar Pradesh respectively. The problem is that women’s wages have not kept up. Draft legislation being considered by the BJP government is said to have stripped away efforts to work towards pay parity for men and women. Gender concentration in low-wage industries has increased. In manufacturing sector, tobacco products, apparel and textiles account for the largest share of women entrepreneurs, as these industries have lower physical requirements. In services, it is education, sewage, refuse disposal and financial intermediation services that attract female entrepreneurs. The gender of a business owner also tends to skew employee gender in his or her company, a woman business owner will tend to have more women working in her firm. Unfortunately, there is still a pay disparity between men and women..
Ejan Ghani, a World Bank economist writing on the blog Live Mint, astutely observes that the availability of transportation infrastructure will help women continue to increase their presence and pay in the workforce, Women are more dependent on infrastructure because they live more complex lives with the multiple roles of spouse, mother, caregiver etc. Also, higher minimum wages may benefit women more in time. 1. Pushing up the minimum wage helps improve all wages (including those in higher categories. It has the most impact on the category immediately above. - 2. Higher wages help women as they occupy lower positions in the economy. - 3. Keynesian economic theories suggest that higher minimum wages increase consumption which helps the economy grow. - The typical argument against higher minimum wages is that it will reduce employment. While that may sometimes happen, often pay raises to low paid workers leads to greater productivity and thereby helps organizations absorb the cost. - Higher productivity has also been noticed in minimum wage rises as grateful workers work more efficiently and stay in their jobs longer. The NGO Oxfam has been studying “inequality” for several years now, and this year Winne Byanyima, Executive Director of Oxfam shared some key points that Indian planners and labour activists should note * 4. First, she notes that gender is a key factor in wealth and income. Even at the global billionaire level, nine out of ten billionaires are male. Winnie also observes that many wealthy people benefit from inheriting wealth. One third of all billionaires inherited much of their fortune. Further, the Oxfam report “Private Wealth or Public Goods” asserts that the wealth of the world’s billionaires increased by twelve percent last year. Conversely, the poorest half of humanity, 3.8 billion people, saw their wealth decrease by 11 percent. Kudos to Delhi Labour Minister, Mr. Gopal Rai. Chief Minister Arvind Kejriwal and Deputy Chief Minister Manish Sisodia have all demonstrated an unwavering commitment to higher minimum wages and the enforcement of labour law. Their pioneering work will put pressure on the other states and the overall result may be a faster growing economy. Higher wages, forces institutions to seek efficiencies which our economy needs desperately overall! Written by Pravin JP Arapurakal, Editor of CitizenzNews. Pravin is based in Kerala but travels frequently. He also serves as National President of Shramik Vikas Sangathan which has active volunteer groups in 18 states. *. 4. From an article and presentation prepared in January 2019 for the World Economic Forum in Davos, Switzerland.